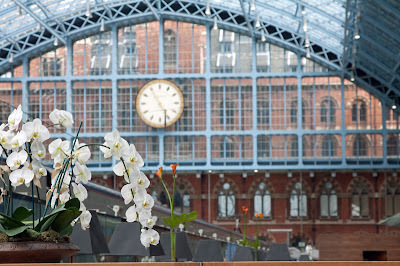 The champagne bar at St Pancras station claims to be the longest champagne bar in th world. Still a great place to wait for or say goodbye to friends arriving or leaving on the eurostar. In winter the seats are heated so very cosy too. This photo has unique composition and colors. And mood. I love it. Golly - St Pancras must have changed since I was last there! Looks wonderfully civilized. Wonderful. It was stunning to arrive at St Pancras Int'l Train station. What an amazing, what a lovely building. My wife and me have taken the ICE from Stuttgart to Cologne, the Thalys from Cologne to Brussels and the EuroStar from Brussels to London. It was a birthday present for me and a great experience. You should know that the Stuttgart main station will reconstruct from a comfortable overground dead-end to an underground through station. I like dead-end stations like St Pancras very much. Sure must have changed since I was there. Heated seats at a bar!! That's brilliant!!! Someday I'm going to have a glass of champagne here! One of my aims is to spend half a day doing monochrome around that station; must get organised. Heated seats? I'd never heard of such a thing before, but it sounds so luxurious! Lovely composition of a beautiful and interesting place. Champagne and a heated seat. One might never leave! My daughter treated me to afternoon tea (with champagne) in the St Pancras Grand restaurant one Sunday afternoon, when they have live jazz too. I can highly recommend it - wonderful experience! I love this shot, look at that lovely orchid!